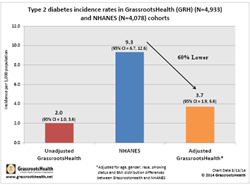 GrassrootsHealth published data from its D*action public action study showing greater than 50% lower incidence rate of type 2 diabetes in the GrassrootsHealth cohort with substantially higher vitamin D levels than a cohort representing national averages. It is time to make a change in public health, the safety and benefits of vitamin D supplementation have been proven. The study appears in the January 2016 (volume 155, part B) issue of The Journal of Steroid Biochemistry and Molecular Biology. GrassrootsHealth data is collected from at-home 25(OH)D blood tests from people of all ages, health statuses, and geographic locations. Along with each blood test, participants also complete a health questionnaire. We ask that participants complete a new test and questionnaire every 6 months for 5 years to collect long-term data. For this study on diabetes, the GrassrootsHealth data was compared to data from the National Health and Nutrition Examination Survey (NHANES). NHANES is a study program, combining interviews and physical examinations, designed to assess the health and nutritional status of adults and children in the United States. To match the data from the two data sets for comparison, GrassrootsHealth data was limited to participants 20 years and older residing in the United States who had not had a history of diabetes more than a year before enrollment. The GrassrootsHealth cohort has a median 25(OH)D level of 41 ng/mg vs. NHANES with a median of 22 ng/ml. When comparing the number of cases seen in each population group in the study period, the GrassrootsHealth cohort has a full 60% lower incidence rate of diabetes.